This post has been a long time coming. For months I have been reading about the food world’s love affair with Jerusalem, dropping hints to my husband – selective hearing? 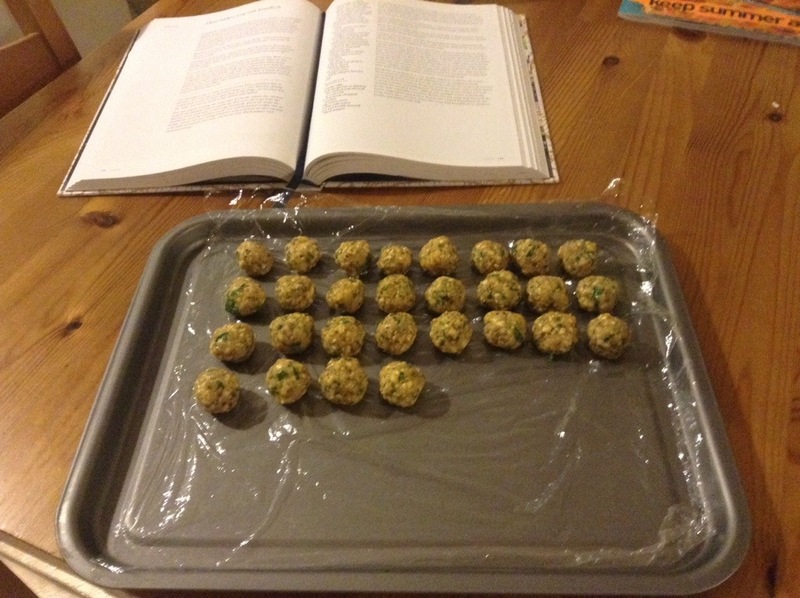 – and ogling pictures and tweets of peoples’ home recipe triumphs. Finally, I just went and bought it. 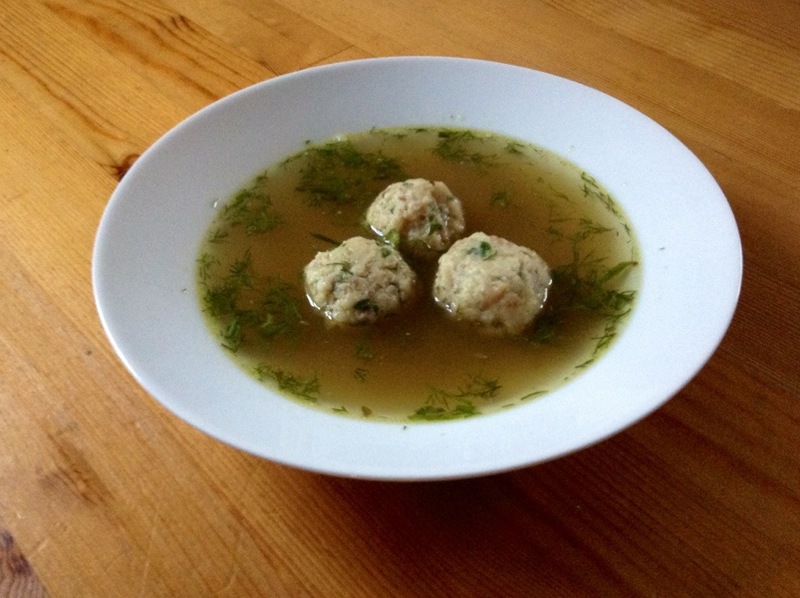 Call me old fashioned, but I had to start with chicken soup with matzo dumplings, otherwise known as knaidlach (p.144). There is something so comforting about chicken soup, rich, golden hued and bursting with flavor. If this book could make me create a better version of something I’ve made innumerable times, that would really be something. Now, I haven’t read through all of the recipes yet, but this one is definitely not a quick weeknight meal. With three hours of cooking and two hours of chilling, I think it’s safe to say this should be saved for a leisurely Sunday afternoon rather than a home-at-5:30-and-starving Monday night. Not to be beaten – at least not straight away – I went to work on the chicken broth anyway, searing the chicken and simmering it together with lots of veg in a very, very full pot. 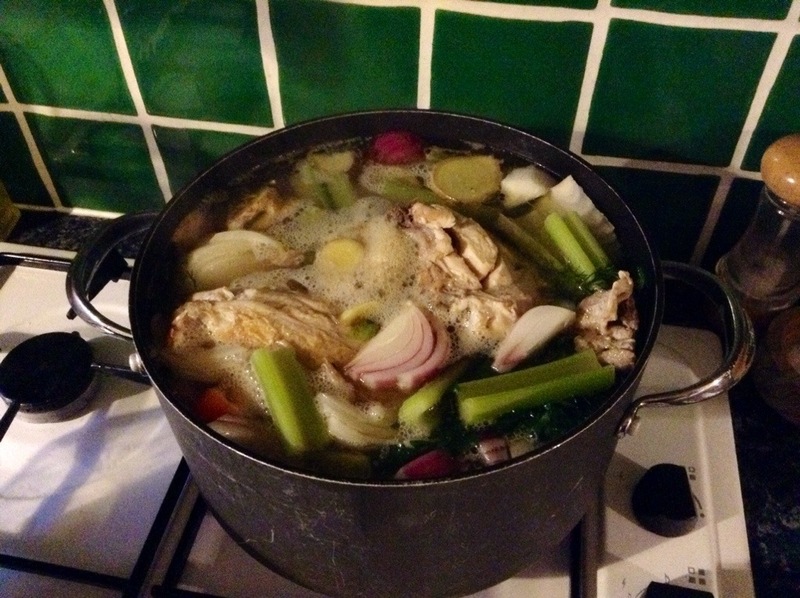 The next day I carried on with the recipe, having rested the stock overnight in the fridge – only because I wanted to go to bed at a reasonable hour the night before and not out of any requirement of the recipe. I stripped the meat from the bones and simmered the bones and vegetables for a further hour. Then I realized the knaidlach also needed two hours of chilling and 30 minutes simmering. Crap. Needless to say, those got put off for another day and social engagements and lie ins saw me to Sunday afternoon before I managed to get my act together and finish this soup. If you’re more organized than I was, it doesn’t need to be such a palaver. But even after a week of having to do things step by step and lots of frustration, this was by no means an anticlimax. No, it’s not what I would consider traditional. It isn’t full of tender carrots and crisp green beans and there are no silky noodles to slurp up, but what you have got is perfect chicken broth that is rich in color and flavor and pillowy, parsley-flecked dumplings. It was surprisingly filling and as an added bonus you have a whole chicken’s worth of moist, tender meat to use for another meal. Instead of discarding the veg as suggested, I scooped it out and ate it – waste not, want not! You could use the carrots and turnips for a vegetable mash or use it all to make a tasty gravy, just don’t waste it! The vegetables too are full of that great chickeny flavor and are beautifully cooked. The next time I make this soup I will dice up the carrots and turnips and add them to the soup, but I wanted to do this by the book this time. The only place I did stray was in using matzo crackers ground up in the food processor rather than matzo meal because I couldn’t find any in our local shop. It worked wonderfully, although I don’t know how the rest of the box will fair as they’re pretty darn bland. I’m sure we’ll find a use for them somewhere though! It was a pretty good start for Jerusalem in my kitchen. I can’t wait to discover the next mouth-watering recipe, but I’ll be sure to read it properly next time. I have all 3 Ottolenghi books and quick recipes they ain’t. However the instructions are incredibly detailed and every resulting dish has been excellent. 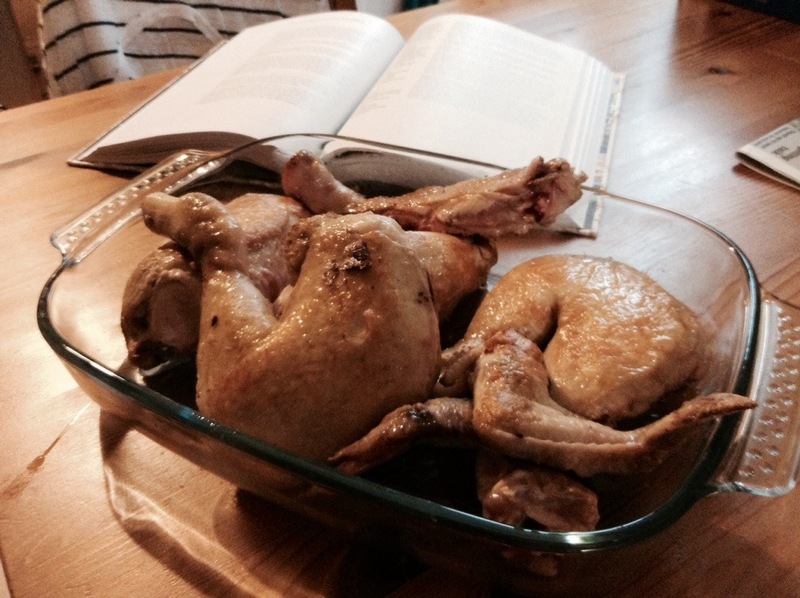 Your review of this recipe was similarly detailed so found it really useful and interesting. Thanks Sally! Can’t wait to try another one! I hope your pleas don’t fall on deaf ears as mine did! Congrats!!! I’m so glad you’ve done it. I made a Jerusalem recipe last night too. I’m really impressed. Chicken soup with knaidlach is in my blood. It’s part of my heritage, though I try to avoid the knaidlach because they sit in your stomach like lead for a couple of days. This is a soup my family and I save for special occasions, holidays and gatherings. I’m so excited that you made this. I’m coming over! You’d be more than welcome! I found the knaidlach quite pillowy and light really and they’ve definitely not hung around too long in my belly because I’m starving! Hope your recipe from last night will go up on your blog sometime soon? Aw yes. I’ve been so busy at work that I haven’t had time to post, even though I’ve been cooking. I”m aiming for tomorrow. 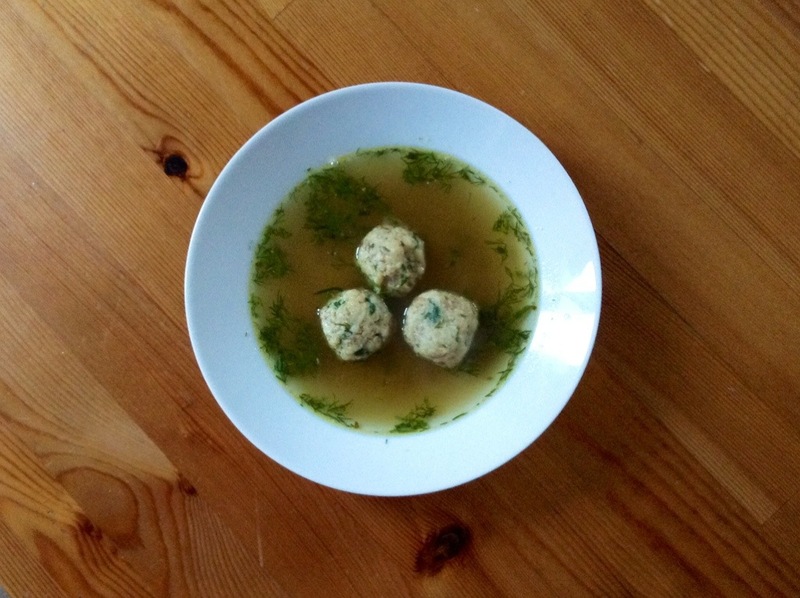 I”m glad your matzoh balls were light. When they’re flufly like that, nothing beats them! I miss the art of slow cooking. There was nothing like the soups my Nana made because she would take all day (days) making them. One forgets how good this kind of soup is until they have it again. Good for you for taking on the time and adventure to make this. It was quite a slog, but enjoyable all the way! And you’re right, time + love = delicious. Hi Pami! Bravo for sticking with it and getting it done all the way through a blog post! I’m glad to hear that the traditional recipe for such a staple had a happy result. 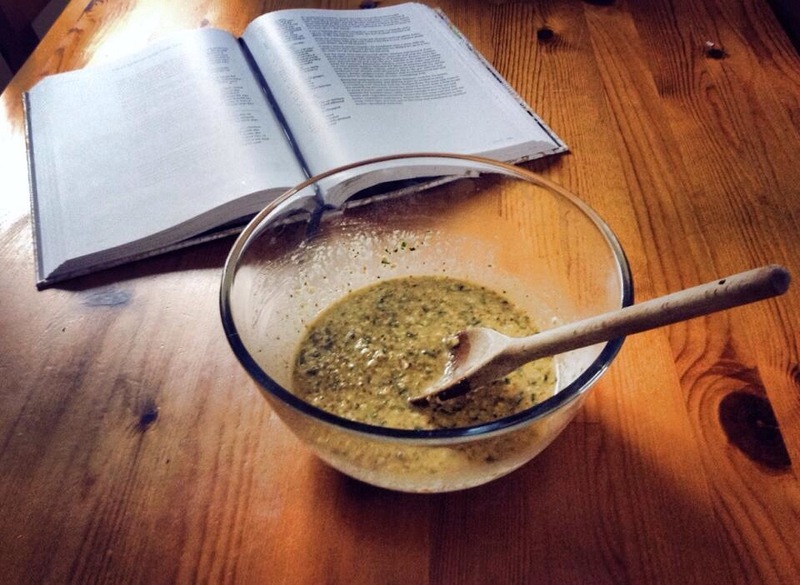 I have been making more of the “new to me” recipes in the book, which I suspect will wow you when you get there. You were brave to even think of chicken soup and knaidlich in terms of a weeknight. Steps over several days is a great way to go. When I make homemade chicken soup, I have a huge pot I bought at the kitchen supply store for cheap and I make 3 chickens at once and end up with enough soup to freeze quite a bit. Then the next time, all you have to do is make the knaidlich and the process is oh so much quicker! So what are you trying next? Hope you’ll experiment with September’s ingredients pom molasses and we have another good one coming up in a few days! Hi Beth, now I’ve put my toes in the water I’d like to try something a bit different next. I haven’t decided yet, but I’ll definitely keep you posted! Your knaidlach look like none I’ve ever seen before – light, fluffy, and savory. Great post. Thanks! Maybe it’s using the matzo crackers instead of matzo meal? They were very fluffy.